There are 2.3 billion square feet of “self-storage” space in America, or more than 7 square feet for every, man, woman and child in the country. Texas, Florida and California lead the country with the most storage space. It’s now “physically possible that every American could stand—all at the same time—under the total canopy of self-storage roofing,” boasts the Self Storage Association. There are about 51,000 storage facilities in the country—more than four times the number of McDonalds. “We have too much. We’re overhoused, overclothed, overfed and over-entertained,” said Don Aslett, getting right to the point. Aslett would know; he’s been poking around houses for 50 years. In college Aslett started what has become one of the country’s largest cleaning companies, and his books on clutter helped to establish the genre. People call Aslett, saying, “We don’t know how all this stuff got here.” Think of it as a whodunit. He solves the mystery and gently interrogates the guilty. Ask yourself: “Does this item enhance your life?” If not, get rid of it. We’re crowding ourselves out of our houses. And it’s not just stuff. Work has come home. Home offices are like small, overwhelmed rail yards, heaped with paper and tangled with cords for all the devices associated with a computer (printers, backup hard drives, routers, scanners, backup power, speakers). The computer or desk is often tagged in a flurry of Post-it Notes in an attempt to remember obscure computer prompts. The computer itself presents a virtual heap of emails, and text, sound, photo and video files. Entertainment has come home, too. Television sprawls out to 120 or 240 channels or more. There are more TV sets than people in the average home. Adults are looking at screens—televisions, computers, cell phones, even GPS devices—about 8.5 hours a day, according to a study by the Council for Research Excellence. TV ads claim about an hour of each day. And the time spent watching television—72days out of each year—continues to increase, alongside the rapid rise of watching online videos. Somewhere in there, between the physical and virtual clutter, we are losing the ordinary qualities of home—the solitude to recollect, the time for families to talk. (Yet another study has clocked only 14.5 minutes a day of actual conversation between parents and children.) We are losing the “nothing much” that is home. The room for tumult and quiet, for passing the time with friends, for the ordinary pleasures of a day well lived. A happy home, said the philosopher Gaston Bachelard, frees us to daydream. It allows us to “dream well,” he said, and enlarge our imagination. Clutter is choking our shelters. Is there any room left for us in our houses? If we believe the gospel according to decluttering gurus, an awakening awaits those who clean house. 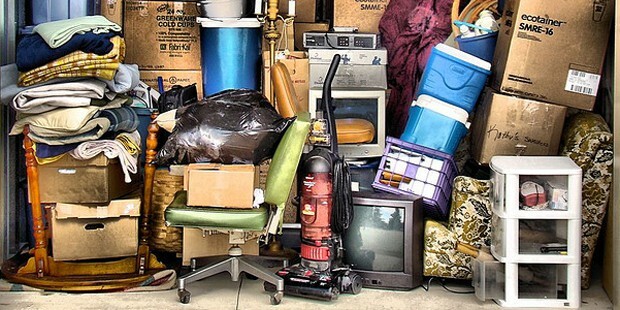 Somewhere under all the junk is what we think we’ve lost—ourselves, our home, our family, our sanity, our soul. But the decluttering gurus can only provide a material solution to a spiritual problem. They are confusing symptoms and causes. 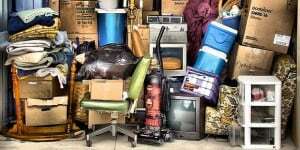 A cluttered house with a never used piano or family dinner table buried under junk is a symptom of materialism run amok. It’s not the cause. Cleanliness is good, but is it really next to godliness? You may be no more happy or wise in a cleaner house. This mess is us. Forget the lists of seven simple steps that morph into hundreds of steps, forget the “in-home design consultation” with the California Closets organizer. The lesson that the lists seldom arrive at is this: Our lives are finite. That’s the lesson we never want to hear. Ignore the decluttering gurus who pile step upon step. Don’t clutter your life with preparation and endless lists. Take this advice from the decluttering coach who calls herself “FlyLady”: Grab 27 things and remove them. Repeat. What’s keeping you from living? Throw it all away, step over it, push it into a corner, under a tarp, into the garage, barn, storage shed. Mice, rats, mold, mildew will have their way. Just go live your life.